"Trauma Center" redirects here. For the television series, see Trauma Center (TV series). For the video game series, see Trauma Center (video game series). For other uses, see Trauma Center (disambiguation). Typical trauma room at Level I Trauma Center. In the United States of America, a hospital can receive trauma center status by meeting specific criteria established by the American College of Surgeons (ACS) and passing a site review by the Verification Review Committee. Official designation as a trauma center is determined by individual state law provisions. Trauma centers vary in their specific capabilities and are identified by "Level" designation: Level-I (Level-1) being the highest, to Level-III (Level-3) being the lowest (some states have five designated levels, in which case Level-V (Level-5) is the lowest). The operation of a trauma center is extremely expensive. Some areas—especially rural regions—are under-served by trauma centers because of this expense. As there is no way to schedule the need for emergency services, patient traffic at trauma centers can vary widely. A variety of methods have been developed for dealing with this. A trauma center will often have a helipad for receiving patients that have been airlifted to the hospital. In many cases, persons injured in remote areas and transported to a distant trauma center by helicopter can receive faster and better medical care than if they had been transported by ground ambulance to a closer hospital that does not have a designated trauma center. The trauma level certification can directly affect the patient's outcome and determine if the patient needs to be transferred to a higher level trauma center. Trauma centres grew into existence out of the realisation that traumatic injury is a disease process unto itself requiring specialised and experienced multidisciplinary treatment and specialised resources. The world's first trauma centre, the first hospital to be established specifically to treat injured rather than ill patients, was the Birmingham Accident Hospital, which opened in Birmingham, England in 1941, after a series of studies found that the treatment of injured persons within England was inadequate. By 1947, the hospital had three trauma teams, each including two surgeons and an anaesthetist, and a burns team with three surgeons. The hospital became part of the National Health Service on its formation in July 1948 and closed in 1993. The NHS now has 27 major trauma centres established across England, 2 in Scotland, and one planned in Wales. According to the CDC, injuries are the leading cause of death for American children and adults ages 1–44. The leading causes of trauma are motor vehicle collisions, falls, and assaults with a deadly weapon. In the United States of America, Drs. Robert J. Baker and Robert J. Freeark established the first civilian Shock Trauma Unit at Cook County Hospital in Chicago, IL on March 16, 1966. The concept of a shock trauma center was also developed at the University of Maryland, Baltimore, in the 1950s and 1960s by thoracic surgeon and shock researcher R Adams Cowley, who founded what became the Shock Trauma Center in Baltimore, Maryland, on July 1, 1966. The R Adams Cowley Shock Trauma Center is one of the first shock trauma centers in the world. Cook County Hospital in Chicago trauma center (opened in 1966). Dr. David R. Boyd interned at Cook County Hospital from 1963 to 1964 before being drafted into the Army of the United States of America. Upon his release from the Army, Dr. Boyd became the first shock-trauma fellow at the R Adams Cowley Shock Trauma Center, from 1967 to 1968. Boyd returned to Cook County Hospital, where he would later serve as resident director of the Cook County Trauma Unit. According to the founder of the Trauma Unit at Sunnybrook Health Sciences Centre in Toronto, Ontario, Dr. Marvin Tile, "the nature of injuries at Sunnybrook has changed over the years. When the trauma center first opened in 1976, about 98 percent of patients suffered from blunt-force trauma caused by accidents and falls. Now, as many as 20 percent of patients arrive with gunshot and knife wounds". In the United States of America, trauma centers are ranked by the American College of Surgeons (ACS), from Level I (comprehensive service) to Level III (limited-care). The different levels refer to the types of resources available in a trauma center and the number of patients admitted yearly. These are categories that define national standards for trauma care in hospitals. Level I and Level II designations are also given adult and or pediatric designations. Additionally, some states have their own trauma-center rankings separate from the ACS. These levels may range from Level I to Level IV. Some hospitals are less-formally designated Level V.
The ACS does not officially designate hospitals as trauma centers. 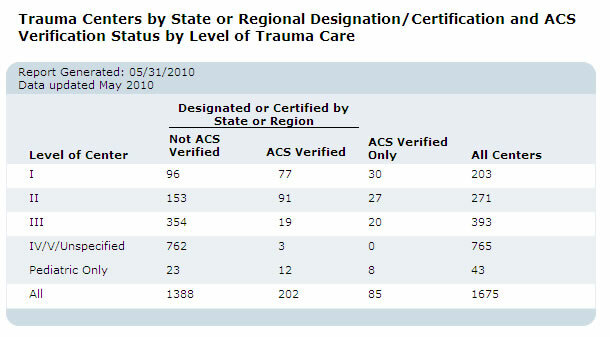 Numerous US hospitals that are not verified by ACS claim trauma center designation. Most states have legislation which determines the process for designation of trauma centers within that state. The ACS describes this responsibility as "a geopolitical process by which empowered entities, government or otherwise, are authorized to designate." The ACS's self-appointed mission is limited to confirming and reporting on any given hospital's ability to comply with the ACS standard of care known as Resources for Optimal Care of the Injured Patient. The Trauma Information Exchange Program (TIEP) is a program of the American Trauma Society in collaboration with the Johns Hopkins Center for Injury Research and Policy and is funded by the Centers for Disease Control and Prevention. TIEP maintains an inventory of trauma centers in the US, collects data and develops information related to the causes, treatment and outcomes of injury, and facilitates the exchange of information among trauma care institutions, care providers, researchers, payers and policy makers. Note: A trauma center is a hospital that is designated by a state or local authority or is verified by the American College of Surgeons. A Level I trauma center provides the highest level of surgical care to trauma patients. Being treated at a Level I trauma center can reduce mortality by 25% compared to a non-trauma center. It has a full range of specialists and equipment available 24 hours a day and admits a minimum required annual volume of severely injured patients. In addition, these trauma centers must be able to provide care for pediatric patients. Many Level II trauma centers would qualify for Level I if they were equipped to handle all pediatric emergencies. Key elements include 24‑hour in‑house coverage by general surgeons and prompt availability of care in varying specialties—such as orthopedic surgery, cardiothoracic surgery, neurosurgery, plastic surgery, anesthesiology, emergency medicine, radiology, internal medicine, otolaryngology and oral and maxillofacial surgery (trained to treat injuries of the facial skin, muscles, bones), and critical care, which are needed to adequately respond and care for various forms of trauma that a patient may suffer and rehabilitation services. Most Level I trauma centers are teaching hospitals/campuses. Additionally, a Level I center has a program of research, is a leader in trauma education and injury prevention, and is a referral resource for communities in nearby regions. A Level III trauma center does not have the full availability of specialists, but does have resources for emergency resuscitation, surgery, and intensive care of most trauma patients. A Level III center has transfer agreements with Level I or Level II trauma centers that provide back-up resources for the care of patients with exceptionally severe injuries (e.g., multiple trauma). A Level IV trauma center exists in some states where the resources do not exist for a Level III trauma center. It provides initial evaluation, stabilization, diagnostic capabilities, and transfer to a higher level of care. It may also provide surgery and critical-care services, as defined in the scope of services for trauma care. A trauma-trained nurse is immediately available, and physicians are available upon the patient's arrival to the Emergency Department. Transfer agreements exist with other trauma centers of higher levels, for use when conditions warrant a transfer. Provides initial evaluation, stabilization, diagnostic capabilities, and transfer to a higher level of care. May provide surgical and critical-care services, as defined in the service's scope of trauma-care services. A trauma-trained nurse is immediately available, and physicians are available upon patient arrival in the Emergency Department. If not open 24 hours daily, the facility must have an after-hours trauma response protocol. A facility can be designated an adult trauma center, a pediatric trauma center, or an adult & pediatric trauma center. If a hospital provides trauma care to both adult and pediatric patients, the Level designation may not be the same for each group. For example, a Level I adult trauma center may also be a Level II pediatric trauma center. This is because pediatric trauma surgery is a specialty unto itself. Adult trauma surgeons are not generally specialized in providing surgical trauma care to children, and vice versa, and the difference in practice is significant. ^ "Verification, Review, and Consultation Program for Hospitals". facs.org. Retrieved 2017-11-23. ^ Andrew B., MD Peitzman; Andrew B. Peitzman; Michael, MD Sabom; Donald M., MD Yearly; Timothy C., MD Fabian (2002). The Trauma Manual. Hagerstwon, MD: Lippincott Williams & Wilkins. p. 3. ISBN 0-7817-2641-7. ^ American College of Surgeons (2006). Consultation/Verification Program, Reference Guide of Suggested Classification. American College of Surgeons. p. 3. ISBN 0-7817-2641-7. ^ Wilson, William C. (2007). "History of Trauma". Trauma: Emergency Resuscitation, Perioperative Anesthesia, Surgical Management. 1. New York: CRC Press. p. 18. ISBN 0824729196. Retrieved 2012-05-17. ^ "R Adams Cowley Shock Trauma Center History". University of Maryland Medical Center. 27 March 2008. ^ "Old Cook County Hospital page". Cook County Hospital. Archived from the original on 2009-02-27. ^ "National Safety Council Presents David R. Boyd, MDCM, FACS, With Service to Safety Award". American College of Surgeons. Archived from the original on 2011-07-21. ^ "ACS Verification Site Visit Outcomes". facs.org. Retrieved 2017-11-23. ^ "About the VRC Program". American College of Surgeons. ^ Faul, Mark; Sasser, Scott M.; Lairet, Julio; Mould-Millman, Nee-Kofi; Sugerman, David (2015). "Trauma Center Staffing, Infrastructure, and Patient Characteristics that Influence Trauma Center Need". Western Journal of Emergency Medicine. 16 (1): 98–106. doi:10.5811/westjem.2014.10.22837. ISSN 1936-900X. PMC 4307735. PMID 25671017. ^ Ackerman, Todd (2011-03-25). "UTMB trauma center Level 1 again". Houston Chronicle. Retrieved 2011-03-26. ^ a b c Public Relations. "Trauma & Critical Care Center-Trauma Center levels". Khon Kaen Regional Hospital (in Thai). Thailand: Department of Hospital Health. Archived from the original on 2003-07-21. ^ "Emergency Trauma Center". Pioneers Medical Center. Meeker, Colorado. Archived from the original on 2013-10-31. Retrieved 2014-12-29.